You'll notice that this animation also includes a Sonic the Hedgehog head prop created by me and attached to a blue Happy Bunny body. That prop was the start of my own Sonic the hedgehog that I was going to make for the community before Chaostoon announced his intention to make his public. 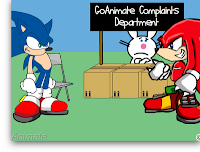 Noticing the success Chaostoon had with his Sonic April Fools day joke (animation embeded below) I thought I'd do my own experiment based on a comment I made on GoAnimate's forums. I don't remember the exact comment but in response to someone asking how to get a lot of views on GoAnimate I joked 'just make something with Sonic the Hedgehog in it' - after observing Chaostoon's animation get in excess of 30,000 views. Now I've made a Complaints Dept. with Chaostoon's Sonic in it... we'll see if that pulls in the views to my etourist basic GoAnimate account. By the way...I really love Johnny Hotdog's, Knuckles character. It has a few more moves than Chaostoon's Sonic and I really like the not too polished drawing style. Note also the little nod to the recent removal of the Street Fighter theme from GoAnimate due to the license agreement expiring. Happy Bunny sure will miss Ken in that weird kind of way you become attached to annoyances.